There are many interesting education careers in early childhood development available for students who are dedicated to learning and teaching. Getting an early childhood development degree will empower students to be a positive influence in the lives of many children. Read more to learn about which education careers are available for students with a degree in early childhood development. Early childhood development concerns the social, emotional, physical and mental growth of children. Improper development may result in problems related to health, cognition and even criminality. The goal of early childhood development is to improve children’s learning and developmental capacities so they will be successful in life. Proper development helps children to be confident, attentive and communicative. It also ensures that children have a healthy mind, body and even social life. Not all educational administrators work in a school. Child care and pre-school organizations also need teaching administrators to oversee their program. These organizations include private homes, day care centers, Head Start programs and even religious organizations. Child care administrators are tasked with overseeing office operations, ensuring compliance with regulations and working with parents. Child care administrators must have the appropriate licensure and certification for day care and public school teaching. They must also have excellent communication, organization and leadership skills. Children grow, develop and learn at different paces. Some children have special needs that cannot be met through standardized educational methods. Special education teachers help children with specific needs to overcome barriers to academic, interpersonal and social success. For example, a special education teacher might work with children with autism or learning disabilities master basic skills. They provide a safe and structured learning environment that optimizes learning and interaction opportunities. Special education teachers continually review and assess their students’ social, academic and self-management needs. 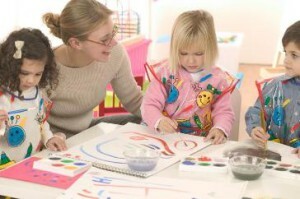 They also constantly work with parents and caretakers to reinforce learning and development. There is a continual need to develop new learning material that is engaging, informative and interesting. As part of this, curriculum developers create curriculum through analyzing the educational need, creating an objective design and selecting the most appropriate methods and materials. Curriculum developers also spend time researching, comparing and analyzing existing materials for improvement opportunities. The process of curriculum development can be quite complex and will involve a curriculum committee that evaluates and approves the final product. Education careers in early childhood development also include jobs that teach adults. That is, Parent educators help children and their parents through providing support, education and advocacy. Many parent educators work for non-profit or religious organizations that offer home visiting programs. Parent educators perform client screenings, coach parents and connect families to community resources. They also facilitate community groups and outreach activities. Parent educators also work for substance abuse treatment facilities as counselor assistants. There are many opportunities for students with a degree in early childhood development. For example, the Department of Human Services in every state employs social workers who take care of foster children. The Department of Education offers various employment opportunities involving research, program development and community outreach. The Department of Health also employs professionals who run health and educational programs for children. In the end, there are many stable careers for students who have a degree in early childhood education. These include administration, special education, curriculum developers and parent educators. Education careers in early childhood development are both fulfilling and meaningful.